My name is Aaron Boyse and I am looking for Work Experience as part of a Computer Networking and Maintenance course that I will be doing in Waterford College of Further Education. I worked on Work Experience as a Bar Man/Waiter in the Brandon House Hotel on two weeks Work Experience. Here I did all is what is expected as a Waiter. I served food, served drinks (hot beverages, beer, soft drinks etc.). I got the Bar area and Lounge ready for each day. 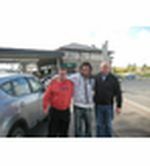 I worked with DFL (David Flynn Limited) for two weeks Work Experience in Ferrybank and Tramore Waterford. Here I helped to refurbish an old Chinese Restaurant and a Games Arcade. I did things like strip away the walls and clear any rurbish that was in the way. Join Today to follow and contact AaronB.